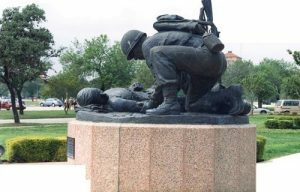 Fort Sam Houston is considered to be the home of Army medicine, since all Army medical training was consolidated there at the end of World War Two. The Base Realignment and Closure Commission of 2005 recommended that all military medical training be consolidated at Fort Sam Houston – popularly known as “Fort Sam.” Both Navy and Air Force medical training programs are scheduled to move from their present locations in the near future. But Fort Sam was not always the home of military medicine – for at least fifty years, it was the main supply depot and headquarters for the US Army on the southwestern frontier . . . and in 1910 it was the birthplace of military aviation, when then-Lieutenant Benjamin Foulois took off from the parade ground in a 1909 Wright Flyer, dubbed “Army Airplane #1” for a series of demonstration flights. Fort Sam Houston started as a single structure, now known as the Quadrangle, an open courtyard with an ornamental clock tower at one end. It was originally meant as a supply depot – and to replace the various existing warehouse structures around the Alamo, which had been used for that purpose by various armies ever since the Alamo was abandoned as a mission and repurposed as a military garrison. By the mid 1870s, military needs had rather outpaced those capabilities offered by crumbling ranges of buildings around Alamo Plaza – and in any case, urban San Antonio had spread out far enough to encompass the old mission. The Army wanted to close the post to save money – and in response, the City of San Antonio donated 92 acres of land on the low hills north of town. This was a chance to build a new and more up-to-date structure; lots of clean new warehouse space to store Army supplies brought up from Galveston and other coastal ports, offices for the supply sergeants and officers to work in, a marshalling yards for wagons, water and pasturage for those teams of draft horses who hauled those supplies to their eventual destination – those Army forts on the far frontier. By the time of Geronimo’s short visit, Fort Sam was the second largest military post in the United States; practically the entire garrison was posted overseas to fight in the Spanish-American War. Teddy Roosevelt’s “Rough Riders” rendezvoused and trained there before shipping to Cuba to charge up San Juan Hill. Fort Sam also supplied the men and material for General John “Black Jack” Pershing’s expedition into Mexico, chasing after Pancho Villa in 1916. Dwight Eisenhower met and married his wife, Mamie Dowd while stationed at Fort Sam as a young lieutenant. General Billy Mitchell was assigned to Fort Sam after being court-martialed and demoted. Practically every Army officer serving since 1880 and up until World War II passed through Fort Sam, at one time or another. Since many of the approximately 900 historical structures on post - quarters, barracks and administrative buildings - are still in use, only the Quadrangle is open to the general public. However, there are two museums on post, which between them give a very good idea of the scope of Fort Sam’s history and present missions: The Fort Sam Houston Museum, and the US Army Medical Department Museum. 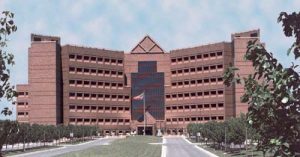 In addition to serving as headquarters for Army Medical Command, Headquarters for US Army South and US Army North, Fort Sam also hosts Brooke Army Medical Center. Fort Sam Houston now covers more than 3,000 acres, just north of downtown San Antonio, on the east side of town adjacent to IH 35 on one side, and significant roadways such as Rittiman, Harry Wurzbach, and North New Braunfels. It is adjacent to the San Antonio Country Club, Mahncke Park, and surrounded by suburbs such as Terrell Hills, Tobin Hill and Government Hill. Government Hill, which contains many distinctive old houses in poor condition, has been designated a historic area, and is considered by many to be in the early stages of gentrification. The Fort Sam Houston National Cemetery is also adjacent to the post.